Canker sores are usually not serious, but they can be a real pain. A canker sore is a small and shallow ulcer that erupts inside our lips or around the oral cavity. 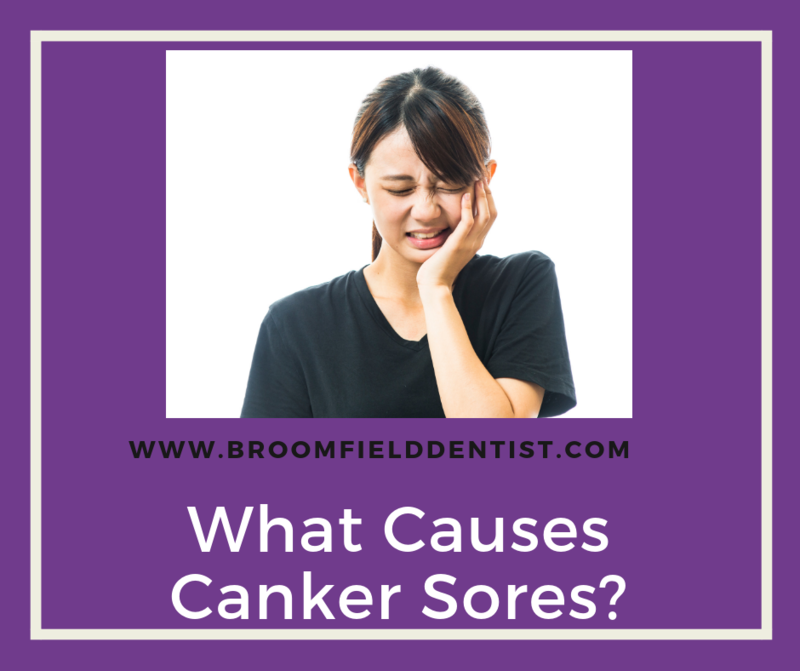 The specific, definite cause of most canker sores is still unclear, but there seem to be several triggers associated with them. Knowing the triggers can help to prevent canker sores from showing up in the first place. Highly acidic foods—pineapples, lemons, strawberries, tomatoes, sour candies, juices, etc. — can all trigger canker sores to form, or worsen those that have already formed. Foods and drinks with high acid content can irritate and enflame tissues that are already under stress. If you’re prone to canker sores, or feel one coming on, stay away from these items for awhile. Nutritional deficiencies can also trigger canker sores to form, particularly concerning iron, folic acid, and zinc. A B-12 deficiency is often to blame for triggering canker sore flare-ups in children. Calcium deficiencies can worsen existing canker sores. Anything that bruises or damages the tissues in your mouth can trigger canker sores. Damage caused by braces or mouth guards rubbing against tissues can also lead to them. Using harsh mouthwashes or oral products can trigger them. Tissue damage can be caused by rough brushing. Any small cuts or scrapes in your mouth can cause canker sores to form, so avoid chewing on pens and other foreign objects, or eating rough or sharp foods. Any infection in your body can leave you more prone to canker sores. If your immune system is compromised due to shortterm illness or a long-term condition, you are more likely to develop them as well. Mental or emotional stress is one of the most common triggers for canker sores. Being stressed or upset can weaken your immune system, making you more vulnerable to the formation of sores. Physical stress on the tissues of your mouth can also contribute to their formation. Braces, dentures, or mouth guards, can rub against the delicate tissues inside your mouth when they don’t fit properly. The irritation from these appliances is often responsible for the formation of painful canker sores. For mouth guards or dentures, adjustments can be made to make them fit better. If braces are causing irritation, simply applying dental wax to the area can help keep sores from forming. If canker sores are a regular problem for you, use a soft-bristled toothbrush and avoid being heavy-handed while brushing. Find a toothpaste that doesn’t contain sodium lauryl sulfate. Finally, avoid foods that tend to trigger or worsen them, and rinse frequently with salt water. To learn more, visit https://broomfielddentist.com/. Dr. Mary Peebles-Turner and her wonderful team are dedicated to serving their patients in Broomfield, Colorado with top-quality dental care. https://broomfielddentist.com/wp-content/uploads/sites/23/2018/11/peeblesnovemberpostheader-1.png 788 940 Administrator https://broomfielddental.onestopclients.com/wp-content/uploads/sites/23/2017/04/Broomfield-Dental-Logo.jpg Administrator2018-11-15 21:27:002018-11-15 21:27:00What Causes Canker Sores?